The island of Bohol in the Philippines is still backward in many ways, but its closeness to nature is part of the island's charm. Amidst the rice fields and fishing villages, you'll find some very surprising things: unnatural-looking rounded hills as far as the eye can see, a mysterious island past a mangrove forest, a goggle-eyed primate that fits in your hand, and dazzling white-sand beaches on the next island across the bridge. Here we'll count down the most interesting sights you'll see when you visit Bohol, less than an hour's plane ride from the Philippine capital Manila. Visitors can reach Bohol via Tagbilaran Airport, then take a tricycle, hotel airport transfer, or hired car to any of the destinations in this list. Seen from atop the main viewing deck in Carmen town, the Chocolate Hills look absolutely unnatural: a series of giant grass-covered dome-shaped mounds stretching as far as the eye can see. These hills—about 1,200 in all—are distributed over 18 square miles of Bohol's land; the grass cover on the hills dries up and browns in summer, giving the Chocolate Hills their name. The main tourist complex from which to best view the Chocolate Hills can be found in Carmen town, where a restaurant, resort, and view deck have been built on two of the area's highest hills. You'll need to climb about 214 steps up from the driveway to the top of the main observation deck, but the view is worth the long, hard slog. Only a few minutes' speedboat ride from Panglao Island stands between you and the excellent diving to be had around the island. A sanctuary just five minutes from scenic Alona Beach delivers a wall with a wealth of small fish, nudibranchs, and anemone. Doljo Beach gives you an eyeful of huge gorgonians and sponges, and the Balicasag marine sanctuary presents an overwhelming variety of sea life, all year round. 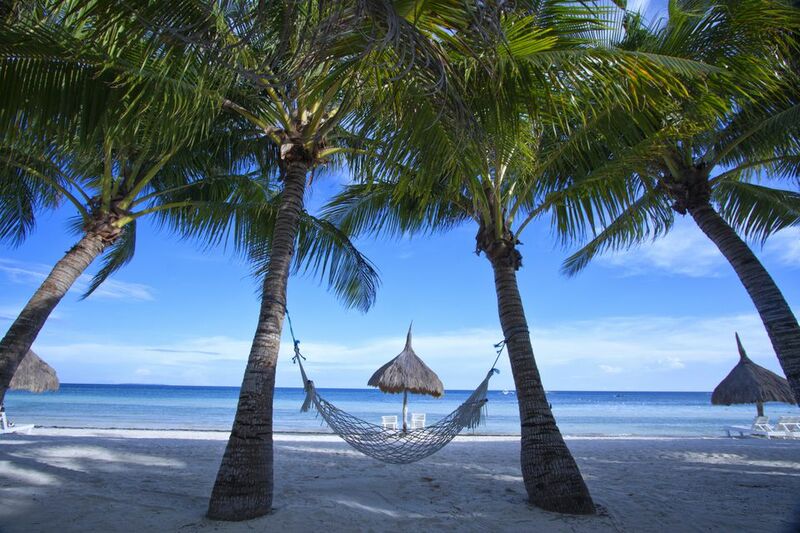 Most resorts in Panglao have a dive shop attached to the premises; ask your local dive master about the best dive spots for the time of the year you're visiting, and you'll have plenty of options within spitting distance of the resort. The town of Anda, Bohol is as far from civilization as you can get—it's so distant, cell phone coverage only sporadically touches a single point on a local hilltop. This distant hamlet is the jumping-off point for a "mystical" tour of Lamanoc Island, an uninhabited limestone outcrop that is rumored to be haunted by spirits. Getting to Lamanoc Island involves sailing aboard a small outrigger canoe (pictured above). Getting through the tourist trail around the island involves plenty of climbing steep stairs and walking on slippery limestone; as you proceed, the local guide will tell you about the prehistoric relics found in the island's caves, the shamanistic rites performed here by local witch doctors, and the legends associated with the town. Beyond Lamanoc Island, Anda and its challenging terrain has also become the setting for the Timex 226 Bohol Triathlon. Bohol's river cruises allow visitors to venture deep into the countryside and see how ordinary people live in the inner towns. Cruises along the Loboc River are popular for the scenery (the calm, clean river is an absolutely relaxing sight) and the floating riverside restaurants. Another river cruise with a more cultural bent kicks off at Cortes town, where guests can ride a local boat called a "bandong" down the Abatan River, visiting the towns of Maribojoc, Antequera, Balilihan, and Catigbian along the way, and ending at Kawasan Falls. Throughout the trip, the guides will explain the history of the river and the significance of the structures you can see along the way (sights include century-old churches and a watchtower). At each stop, the town's "cultural collectives" will perform native dances for your entertainment and serve local delicacies. This adventure center straddles a canyon carved into the limestone by the Wahig River. This gaping maw in the earth provides the setting for much of the fun: from the Skyride's tame cable car traversing the gap, to the more adventurous "Suislide" (pun on "suicide", get it? ), a two-way zipline across the ravine, to the even more death-defying "the Plunge" that drops you off of a platform with only a bungee cord keeping you from hitting the rocks below. The local terrain offers plenty of other adventures, too: guests can go trekking through the canyon (which used to be the hideout of a Filipino revolutionary in the 19th century); go kayaking or tubing right on the Wahig river, or climb up one of the canyon walls. Getting to EAT Danao is difficult without a rented car, though. The Baclayon Church (officially the "Church of Our Lady of the Immaculate Conception") is regarded as the second-oldest church in the Philippines; only the San Agustin Church in Intramuros is older. Symbolizing Catholicism's influence in the island, the Baclayon Church was built from corals bound together by mortar mixed from eggwhite. Inside the vast, dark interior of Baclayon Church, all eyes are drawn to the gilded ​retablo behind the altar, a baroque confection bedecked with backlit icons. Walk to the back of the church and you'll find carroza, or carriages for religious processions; some walls and part of the floors are engraved with the names of devotees presumably buried under the tiles. The Baclayon parish museum is particularly interesting, as the church has been quite assiduous in preserving religious mementos since the parish's founding. Among the relics, you'll find at the museum are ivory icons of Jesus and Mary; relics of Jesuit saints; church music written on sheepskin; priestly vestments; and religious artwork. Photography is not allowed in the museum. These tiny, giant-eyed primates are no larger than a child's fist and can be found around Bohol if you know where to look. The tarsiers are well-adapted to a nocturnal life: their massive eyes (relative to their skulls) can see very well in the dark, and its large, mobile ears can swivel to better hear their prey. To meet a tarsier face to face, visit the Rio Verde Tarsier Place at Barangay Agape in Loay Town. The place combines a restaurant, tarsier-themed souvenir shop, and tarsier enclosure where guests can see tarsiers up close. Rio Verde's enclosure is not very pleasant for tarsiers, though; if you want to see tarsiers in a more humane place, closer to their natural habitat, visit the Philippine Tarsier Sanctuary instead, in Corella town.